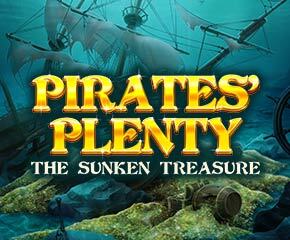 Pirates Plenty is a new addition in the list of Red Tiger Gaming portfolio. This slot is visually-appealing and offers five reels, three rows, and twenty paylines. The slot is compatible with almost all devices and can be played from just a min bet of 20p to a max bet of £40.00 per spin. The Pirates Plenty has 9 regular icons, 5 of which are icons of the pirate bag along with money, ghostly captain, a rifle, a bottle and a canon. While, the 4 low icons consist of 4 coins portrayed by a spade, diamonds, clubs and hearts. The pirate monkey acts as the Wild icon and can substitute all regular icons. The Captain icon appears only during Oceans Spins round and will also help players unlock the treasure chests. The Map icons will help players to unlock Treasure Reel. The Logo of this slot acts as the scatter icon which activates Ocean Spins feature. The free spins round of Pirates Plenty slot is called the Ocean Spins feature and can be triggered by landing 3 scatter icons on reels. After which, the players get 10 free spins. If players are able to land the icon of ghostly captain on 1 of reels during these free spins, then a key will get placed in first of 3 treasure chests and when the players succeed in collecting 3 keys then they can open the treasure chest and extra free spins can be won. 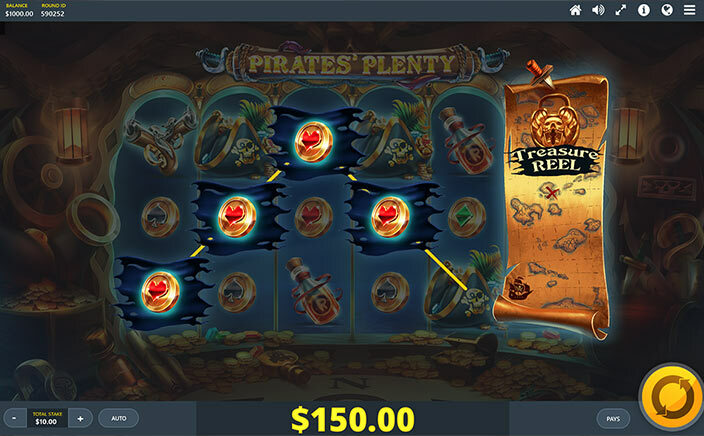 Pirates Plenty slot is one of the finest slots by Red Tiger Gaming. The slot has a large variety of features which can be used to win some huge bucks. The slot has moderate to high volatility and offers a chance to win 1000 coins in gameplay.